Jennifer made an evening of de-stressing enjoyable, comfortable and very quickly pushed aside any inhibitions, without our realising! Jennifer genuinely enjoyed the class and her laughter was infectious. Recommended, without any hesitation. I left the class totally relaxed and rather high! Well done. My cat Henrietta has really benefitted from the healing given by Jennifer and I'm certain that these sessions have helped ease her painful back leg. Henrietta is deeply relaxed and totally enjoys her cat nap during the sessions. I thoroughly recommend this lady. I recently attended Jennifer Johnson's Workshop on "The Power of Positive Thinking". Jennifer is well versed in her subject and she presents in a highly personable manner. I thoroughly enjoyed the Workshop - the interactive exercises were excellent and our group spent a very positive morning together. I am sure that the Laughter Yoga exercises did us good too. Thank you Jennifer! I am so grateful to Jennifer for all the help she has given me. Since she has been my coach, she has enabled me to focus on particular aspects of my life that I knew needed sorting but which had previously just been a block. She very cleverly helped me to work out my own route through. With her ongoing help and support I have been able to take various actions of my own choosing and find out all the information I need to move forward. It’s been great and has given me back control of my future, rather than just my letting it happen. From the start I felt comfortable talking to Jennifer and confident that her approach would be a huge benefit to me. It’s amazing how straight away things seemed to become clearer in my mind. I’m still receiving coaching from time to time. I know if there’s anything at all that I need to figure out, Jennifer will be the one to focus my thoughts for me! Thank you so much Jennifer. Jennifer is an excellent coach. She has helped me to set myself some clear actions so that I can progress with certain areas of my life. Jennifer really helped me look at all the options which were available to me and weigh up the pros and cons of each which then made it easy for me to make a decision about things I was struggling with. The coaching sessions I have had have been so worthwhile. Jennifer is so thorough and extremely supportive and encouraging. After every session I come away feeling content, listened to and so focused on what I need to do next. I would recommend Jennifer to anyone -she’s great! Thanks so much for your introductory talk yesterday. Quite a lot of those ladies present, who possibly have rather lonely and uneventful lives, really benefited from having a good laugh. As I am sure you must have realised, your talk was a great success with our members. Being coached by Jennifer is like talking to a long-trusted confidante who has instinctive and accurate insights in to my character, motivations and aspirations. Jennifer informed by a comfortable but nonetheless challenging style of conversation. She has enabled me to quickly open up my mind and understand of where I want to get to with my life and work. She has help me to clarify my goals and made them easy for me to achieve them. Laughter is a wonderful healer and removes barriers on many levels. Jennifer's workshops are refreshing and although to begin with one might be a little self-conscious, that does not last long as she leads her imaginative sessions, and the laughter comes more and more naturally, giving you a great workout. Thoroughly recommended... take a friend too. What a great workshop! I came away inspired and with my energy lifted I felt I could quite literally do anything! I would highly recommend this workshop for anyone wanting to achieve a more positive outlook and learn the strategies to ‘reframe’ negative thoughts and phrases- being positive is a choice! Thank you, Jennifer. Jennifer runs a great Laughter Workshop. a real eye opener and a wonderful experience-entertaining, relaxing, invigorating, all wrapped up in great presentation. Thanks Jennifer and keep up the good work. I would suggest to anyone - have a go, you’ll be delighted with the results. Jennifer's workshop 'The Power of Positive Thinking' was very motivating. I came away with plenty to think about and put into practice. Jennifer was well organised and put a lot of thought into the way the workshop was run which made it enjoyable as well as informative. Highly recommended. Jennifer conducted the session was excellent. At the beginning she explained the benefits of the session, that gave us a clear idea of what we are getting at the end of the session. The session was very well planned with a variety of laughing exercises and ended in a visualisation exercise which took us to the calm and relaxed state. I enjoyed a lot and can’t wait for the next session. Jennifer's Laughter Workout sessions have real benefit both physically and mentally. Jennifer is very friendly and makes everyone feel at ease. The sessions are great for helping with stress and you leave feeling relaxed and happy. It's a great way to meet new people as the sessions are very interactive. I have attended Jennifer's Laughter Yoga sessions on a number of occasions along with many others. Jennifer is a natural in this field and her passion for the Laughter Workout and for helping others to get the most from the class shines through. Jennifer’s positivity and cheerfulness are contagious and you will most certainly leave her session with a big smile on your face. I would love to see more of these sessions taking place in a corporate environment, a great way to motivate the workforce. For anyone who has never ventured into the world of Laughter Yoga, I would thoroughly recommend giving Jennifer a call to find out the benefits of participating in a session. Jennifer has a masterly, gentle and remarkable way of empowering you to resolve even the longest and deepest-standing of problems. She sensitively attunes herself to your life-situation, and by helping you to focus, identify and examine the choices available to you, together with developing required life-skills, she empowers you not just to reach your goals, but to exceed all your previously held-expectations. Life-coaching sessions with Jennifer are pure extraordinary magic!" I’d like to recommend her to you. I have attended quite a few of Jennifer's laughter yoga workout sessions, which have been uplifting and beneficial. Jennifer takes time to explain the benefits of the workouts and she adapts the sessions to the number of people she is expecting. The sessions are very good value for money. Jennifer helps to de stress our many cats. 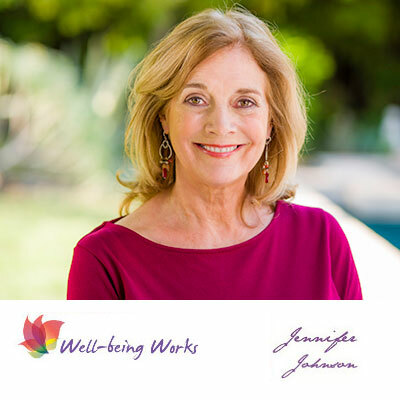 Having worked for years in the field of health and wellbeing, I was very curious about Jennifer’s workshop. What an uplifting experience! To understand and feel what positive thinking does to one, I can highly recommend this workshop. Working with Jennifer was a pleasurable, challenging, life changing experience. She helped me clarify what is most important to me in my life and helped me develop a strategy and framework that I can use to achieve the outcomes I desire in all areas of my life. She has great attention to detail and is a great listener which are skills she uses to great effect to zero in on what makes you tick and devise innovative courses of action. After a few sessions with Jennifer I have completed and had results in my business that I have struggled for years to achieve. Thank you Jennifer, I’d like to recommend her to you. Jennifer's coaching sessions were excellent she helped me to make changes during a very challenging period. Jennifer’s coaching techniques were complemented by her genuine enthusiasm and this winning combination helped me to see things from a different perspective and encouraged positive thinking. I would highly recommend Jennifer’s services. I had wanted to attend Jennifer's laughter sessions for a long time. I find Jennifer to be so warm and encouraging and I experienced her laughter session to be much the same. I really enjoyed learning about the development of laughter workouts/ coaching and 'being a child' again in the session- initially I felt a little awkward, however it is such a gift to learn how to be childlike and 'laugh' through situations that as adults we wouldn't normally do. I look forward to attending a Laughter workout session again. Jennifer gave several healing sessions to my tortoise who was suffering from an eye complaint. I had of course taken him to the vet a few days earlier, and was administering eye drops and giving him daily warm baths as instructed. He eyes were improving slowly, but he remained very lethargic. So that he was quite well after the second session. He continues to be well. Jennifer has such a big heart that Mase my Rottweiler took to her immediately. Mase had just gone through major surgery on his rear leg and was in a lot of pain at the time. The healing had taken longer than originally anticipated, but when Jennifer gave healing he responded and it made a difference to his recovery. Jennifer gave distant healing to Mase afterwards on a couple of occasions before coming back to give a few more sessions. For a big dog he is totally relaxed with Jennifer, he just lies there and thinks its heaven and the energy just oozes through Jennifer. My little French bulldog Lola, is a very anxious little girl, she benefitted enormously from Jennifer's relaxation techniques and ended most sessions snoring. Highly recommended. Jennifer is a gentle, caring and very perceptive coach. She has a generosity of spirit that show’s in her warmth and passion for coaching. It is my privilege and honour to have received coaching from her. She has helped in enabling me to define plans to achieve my goals and also how I think about things differently, too. This allows me to look at any issues or difficulties with objective eyes. Jennifer’s style is empathetic and well grounded. She always manages to ask the right questions at the right time that really makes me stop and think, challenging my own perceptions. I thoroughly enjoy our sessions and recommend her services wholeheartedly. One of our daughter’s suggested I contact a life coach to help sort out my priorities in life. I have always done too much. I was lucky enough to find Jennifer. Her listening skills and her ability to ask questions are excellent. They enabled me to see where change is needed and instigate that change. It hasn’t been easy and I fall back from time to time. Jennifer can even make me laugh when I am feeling down. I am learning to question the negatives of the past and to live in the now. Each day I try to wake up in a positive mood and enjoy life as it is. I would like to recommend her to you.